In the spring, a lawn may need help to encourage new growth and to establish strong roots before summer. Spring is time to fertilise, dethatch and scarify. We have a few tips and tricks to help your lawn this spring. As grass doesn’t grow flower, it needs a different type of fertiliser than other garden plants. The important thing to understand about lawn food is the N:P:K ratio. • The “N” is for nitrogen - that gets the leaves green and growing. • The “P” is phosphorous, that’ll make the roots grow strong and deep. • “K” is for potassium, which strengthens the plants and helps the grass cope with drought and resist disease. A lawn food that is nearly all nitrogen will cause turf to green suddenly, resulting in a massive growth spurt in a very short time, but this isn’t enough to promote a strong root system. After the next mowing, most of the nutrients which are only in the leaves are gone. Because of its fast and tall growth, the lawn will look scalped after mowing, creating a perfect condition for new weed growth. Balance is important in a fertiliser which will encourage growth in all the right areas, both above and below ground. Look for an N:P:K ratio of approximately 11 for nitrogen, 2-4 for phosphorus and 8 for potassium along with some calcium and trace elements. Over time, all lawns build up a layer of dead grass, or thatch, at their base and thatch removal is necessary. It is important to note that you should never de-thatch a lawn just prior to winter as it will not recover green leaf until the spring. Thatch is best removed starting with a rotary mower to slash the lawn down almost to the soil. Use a metal-tined rake to remove the excess thatch. For severe cases or if there is black layer of old crusted organic matter, it’s best to rent a de-thatcheror scarifier from an equipment hire outlet. These tools cut through and remove unwanted material. Many mowing contractors offer a comprehensive de-thatching service for a moderate fee. Spring maintenance will make the lawn stronger against diseases, patchiness, moss and weeds. Following these simple yet effective tips you are preparing your lawn for the harsh conditions of Perth summers. Using a soil wetter is also beneficial for our Perth climate see your previous blog post about soil wetters to find out more. If you are in need of more tips for your lawn feel free to call our office or send images to sales@superiorlawns.com.au with over 30 years in the Perth turf industry we should be able to help you acheive that beautiful green lush lawn you have always wanted. Or if you were interested in replacing your old lawn we can assist with this too. Successful establishment of all lawn types relies on proper soil preparation. Without preparing your soil properly, your lawn can suffer from poor soil drainage, compaction, pH or fertility problems that could have otherwise been prevented. Removing weeds and debris is important when preparing your soil. One of the best methods for eliminating weeds is using an environmentally friendly herbicide, such as a non residual glypohosate herbicide like Roundup. Keep drainage and the grade of your lawn area in mind as it should slope enough to allow surface water to drain away from your house yet be gradual enough to allow for easy maintenance and outdoor activities. Where steep slopes exist (over 40%) or grades change drastically, consider installing retaining walls or other surface plantings in these areas as mowing and other maintenance may become difficult after you've finished. It is recommended to strip the top layer of your soil by around 150mm and this will ensure the removal of any debris, clay or poor growing medium. Beware of areas where mortar or brickies sand were stored as they can cause high pH issues in your soil, its the last thing you want to happen after getting your turf established. When setting up levels, establish and stake or mark out subgrade and topsoil levels, keeping to requirements for any drainage, irrigation and shape work. Luckily the team at Lawn Solutions Australia have an extensive selection of sepcifications for lawn establishment and preparing your soil. Click here to find out more. We have had an amazing autumn but its almost winter and we have a few tips for you to improve your lawn's appearance throughout winter. Don't attempt too many drastic actions; scarifying or topdressing at this time of year is a definite no no, but a last fertilise for the season and even a pigment treatment can work wonders for your lawn. During the cooler months lawn's will generally be at their most vulnerable and unable to repair or maintain good health as well as they can in the warmer seasons. Most Australian lawns are what are known as warm-season grasses; Kikuyu and Sir Walter Buffalo lawns are a few of the most common types and fit into this category. As the name suggests 'warm-season' grasses are actively growing during these months and during the cooler months they slow down and can go dormant; shutting down or discolouring over winter. This is a protection method that lawn grasses use to withstand freezing temperatures and frost with the grass leaves thinning and drying out and the plant's energy being stored in the lower parts of the grass stem and roots area. As the weather starts to cool down, so does lawn care with the grass not growing as vigorously as it did a few weeks ago in most cases. As daylight hours decrease, so does photosynthesis, so by increasing mower heights and leaving more leaf it will help increase the food supply to the grass. Pruning is a great way to plan ahead for winter conditions, as overgrown trees and bushes may increase their shade levels and by the time we notice our lawn has started dying in certain areas, it can be too late to repair the damage. Use this period as an opportunity to fertilise your lawn, and go for an all round or pre-winter fertiliser that contains higher levels of iron, which is essential for good lawn health throughout these cooler conditions and also gives a quick colour boost to your lawn. It is important to address any weed issues before winter, as conditions for their survival improve, while at the same time the lawn's ability to fight against them decreases. Winter weeds such as poa (wintergrass), could potentially inhabit your lawn. Treating weeds before they spread is the best thing to do. Patching up any bare or dry spots will help prevent issues during the cooler months, and will keep your lawn looking good - you can square up any areas with a mattock or spade and fit new turf sections straight onto your lawn. Give us a call if you need a turf roll or slab to patch up areas. 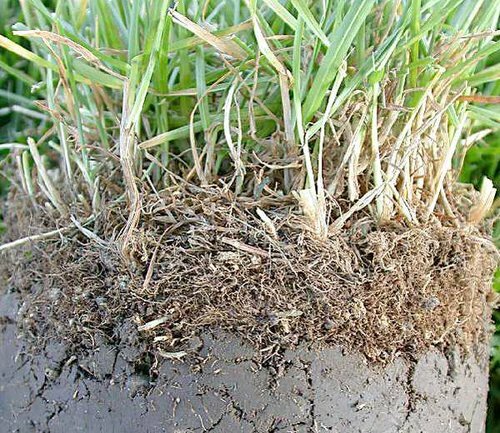 As air and soil temperatures decrease, over watering during cooler temperatures can increase the possibility of lawn diseases or rotting of the thatch latch layer. Aerating your lawn during autumn in considered a good time to do so as the plants are busy enhancing their root zones in preparation for winter and the soil is usually a bit softer than at the height of summer. Use a garden fork and work to break up the soil or hire an aerator that will make quick work of the job. You will be amazed at the results - just check out any golf course and see how often they are aerating or coring to get more airspace into the soil profile. Getting the mowing height right is probably one of the most important things now and its a good idea with the next few mows to increase the height and then you can gradually lower it over winter - not taking much leaf off but more of a tidy up. You will see this on many footy fields around the country as most sports turf curators start to lift the mower height at this time of the year to get a more healthy and robust cushion of turf in readiness for damaging winter sports. Lawn care doesn't need to be difficult and simple hints from us and the Lawn Solutions Australia team can help with products to keep your lawn in top condition this autumn. If you need any more advice or would like to purchase lawn for patch ups or for your whole backyard call us on 9303 2627 today. Superior Lawns knows turf and we want to help you achieve your dream backyard. Our blog provides you with the latest lawn care tips for Sir Walter Buffalo, TifTuf, Nullarbor Couch, Velvetene and Eureka Kikuyu as well as information on large projects we are privileged to be a part of. TifTuf in Perth? Yep, it's perfect for Perth and here's why. The Old Council Verge Debate; Lawn is the Way to go. Hands Down. Superior Lawns Australia won't be beaten on quality, service or price. To get in touch with our turf farm about the types of lawns our suppliers in Perth can provide for you, contact us today to see why our lawns really are superior.